I just received this recipe via e-mail from my good friend and super fitness cook: Dave Ruel. 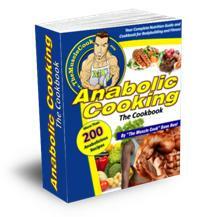 (The author of the Anabolic Cooking Cookbook). but thanks to Dave, the perfect homemade protein bar exists!! One that has all the good stuff and none of the bad. And, in addition from being healthy, they are super cheap to make: less than 50 cents per bar!!! PS: Dave Ruel's Cookbook features many protein bar recipes and over 200 "Anabolicious" step-by-step, easy to make recipes, so you will never be bored with your diet again. You will become a chef in no time, and will keep your family and friends healthy along the way. It's by far the best cookbook I've seen so far, that will help you reach your muscle building and fitness goals no matter what they may be. You will learn every aspect of cooking for healthy living and reaching physique goals.